With the 3200 GT in 1998 Maserati returned to its roots. The luxury coupé was styled by Italdesign, whose founder and head Giorgetto Giugiaro penned, among others, the classic Ghibli, Bora and Merak. The 3200 GT shared the Quattroporte IV's and Shamal's twin-turbo 3.2-liter V8, revised and tuned to 370 bhp while the 3200 GTA was equipped with an automatic gearbox and its engine delivered 368 bhp. Presented to the public at the Geneva Show in 2001, the "Assetto Corsa" was a limited-edition, run-out version of the GT with a special handling package. The 3200 GT was sold mainly in Europe. The most remarkable detail of its design were the tail-lights consisting of the LED diodes placed in the shape of boomerang. 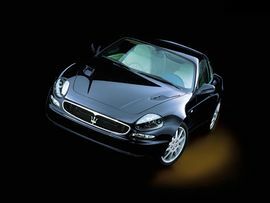 The car was replaced in the beginning of 2002 by similarly designed successor Maserati Coupe, when Maserati decided to turn back on the US market. The original boomerang tail-lights had to be replaced because they didn't fulfill the US requirements for better visibility of the car's rear end during the driving at night.